Hey guys! Did you miss us? We have been in a whirlwind over here. We sold our home, lived in limbo, bought a new one, and immediately dove into full renovations inside and out. We’ve also traveled, spent so much quality time with family and friends, and of course stayed busy as ever creating magic all over KC! All that said, we missed you, and figured you maybe wanted to hear more from us on this humble little blog. We hope you’ve been having as great a summer as us and the AC is kicking wherever you are, as you settle back and join us in part one of our new blog series: Budget Design! It’s become more apparent than ever as we continue working on our new place that - prepare yourselves - home renovation can get pricey and fast. Shocking, no? With that in mind, we wanted to introduce a series that would help you pinpoint details to update in your various spaces that aren’t necessarily a full-on renovation, but will still make a big overall impact. The first room we’re going to tackle is the kitchen: maybe not your first choice for cheap, but easy nonetheless. Promise! Below are three low-budget, high impact ways to change up your look. I hope this isn’t a surprise to you, but I’m always caught off guard by the amount of folks that don’t realize just how much this is dragging down your cabinetry. Even if you aren’t looking to do a full cabinet replace, just taking out those ultra-shiny brass knobs that came straight out of the 90’s and switching them with something modern and interesting is an instant facelift. Living in the age of Amazon, you can find just about anything there in any price point, and if you aren’t in new-cabinet-budget-land but still have a slightly larger spending pool, places like CB2 and even Anthropologie have some killer pulls that will become a focal point. Best thing about this small facelift? You can keep them and re-use them if and when you do get to add some new cabinetry, after which you can pour yourself a drink of choice and congratulate yourself for thinking ahead. Go ahead, you deserve it. This is the most labor-intensive option on this list, so, safe to say you got this. Do you have any open wall space in your kitchen? Do you love kid-and-pet safe spaces to display your favorite dishware and fresh plants and flowers? Have you ever googled ‘open shelving’? Do you see where we’re going with this? 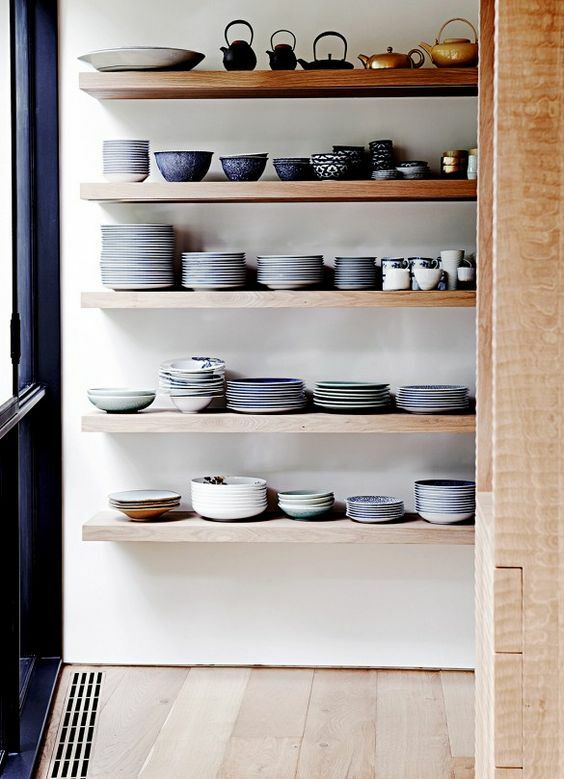 Even if taking out all upper cabinets and replacing them with the wide open shelves of your dreams isn’t an option, hanging any shelving at all will still be a way to suggest the style in your space. Adding some fresh plants or pieces that are uniquely ‘you’ to these shelves is another easy way for you to keep eyes off of the undesirable parts of your space and focused back on the things that inspire you. If going custom isn't an option for you, places like Semi Handmade or Ikea have great options. This was an empty wall in a project that was screaming for simple and easy open shelves! As always, we cannot underestimate the importance of adding some fresh plants and opening a window if it’s possible. Sunlight and greenery can make a world of difference in an otherwise not-perfect spot. What do you think? Are you going to try out any of this simple switches in your home? What are some of your best-loved simple changes? Leave us a comment below, we’d love to hear from you! Today I’d like to chat about a frequently heard word in this era’s design world: Minimalism. Now, if you watched the Netflix doc, you might be worried I’m about to tell you to throw out 95% of your closet, invest in nothing but open shelving, and own exactly three pieces of furniture. While that may work for some, I’m a mom. Not gonna happen in this house. In today’s every-person terms, minimalism doesn’t necessarily refer to using only the bare necessities in your home décor, but rather how you can use minimal amounts of color and knick-knacks to pull together a space. Today’s minimalism is all about helping your space feel open and fresh, even if the room may not be massive. The goal is to place items in the room with intention in order to make the biggest impact with the smallest amount of clutter. Below are some easy-to-adapt tips to help you scale down and brighten up! This is in no way minimalist, but what I will say that there is a color story, it has a neutral backdrop, and there is a rhyme and reason to the way in which this is organized. Image via Pinterest. This will be the biggest first step in any move towards a minimalist space. As someone who has moved homes going on 4 times now, I can personally attest to the incredible amount of stuff my family can accumulate in a shockingly small amount of time. Now, I will not tell you to throw away anything based on amount of clutter alone, but I have a few small questions you may need to ask yourself before declaring toss or keep. Does this bring me joy? If the answer is yes, keep it! If it’s a candle in a scent you don’t love that was given to you secondhand anyways, you might consider donating. Does it have a home? If this thing doesn’t have a designated space, it will need to find one! A huge part of keeping your space open is making sure all the odds and ends have designated space in a drawer or cabinet. Color is a pretty polarizing idea in a home. On one hand, yes, paint color can influence mood and add tone to a room. On the other hand…it can be really distracting. Some people do not at all like the idea of all neutral or white walls. A lot of folks get the idea that all white is too boring or ‘clinical’ and to each their own! But to me, an all-neutral room is a blank canvas. You have some beautiful plants that deserve a spotlight? Pop them against a white wall and see how vivid that green becomes. Do you own a lovely pink throw or pillow? Throw that bad boy on a neutrally-colored couch and it is suddenly a huge focal point. The best part of keeping your major colors neutral is that it allows you to have less objects adding to the color story of your room. Your minimal objects and colors are free to make huge statements without overloading the senses with too many visual distractions. It keeps your room calm while still allowing you to completely change up your home with minimal effort when you’re ready for some new colors. This idea is definitely a playoff of the above point, and something we’ve discussed here on the blog before! But it’s a very important idea so it bears repeating: textures are your best friend. If you want to have a grown-up space, don’t stress so much about colors, and instead consider the textures you are introducing. These small touches will have huge impacts. Multiple wood tones, brick, concrete, linen, and brass all can act as color and add interest to a space without making it feel to active. A jute rug brings earthy warmth to an otherwise entirely modern room. Concrete planters can add a more architectural style while the softness of a leafy green up top balances out the strong lines. Brass hardware in a kitchen or bathroom brings just enough contrast to a traditionally clean and crisp space, and again, adds just enough warmth to keep a room from feeling cold or unwelcoming. These are all fairly small adds that can make or break a room. Neutral window treatments are also a way to let your furniture, art and accessories tell your story rather than clutter it. Think soft shades of white, sand, and grey or natural shades rather than bold colors or patterns. If you find yourself backed into a design corner, I would encourage you to take a step back and ask yourself what mixed textures you could add via pillows, side tables, lamps, etc., instead of how to push even more colors into your mix. While color is absolutely important, I would argue that the constructed elements of your pieces are equally, if not more, important to a room. I hope this list was helpful, and if you have any more minimalism tips to add, feel free to leave them below!